Aeroflot is Russia’s flag carrier and one of the oldest and largest airlines in the world, flying to 123 cities in 52 countries. From Moscow, Aeroflot flies to four cities in the U.S. including New York, Washington, D.C., Los Angeles and Miami. It also serves 47 destinations in Europe and 13 in Asia, making the airline a good option for connecting flights between the U.S. and those regions. Aeroflot has come a long way from its grim Soviet past and the grave safety issues of the 1980s and 1990s. Today, Aeroflot boasts a young and modern fleet that consists mostly of Boeing and Airbus planes. The Aeroflot pilots are competent and well-trained, and its service and food have improved dramatically over the years. On the other hand, Aeroflot Bonus, the airline’s loyalty program, can be cumbersome and confusing for Russians and Westerners alike. It has four zones for Russia, four zones for Europe, and three zones for Asia. It also lumps the mainland U.S. in the same zone as Hawaii and Alaska, which presents some interesting redemption opportunities. The program has some other bright spots as well. One major benefit is the Aeroflot Bonus Family program, which allows three to seven family members to pool their miles. Aeroflot does impose fuel surcharges, but they are relatively reasonable. For example, fuel surcharges on round-trip award seats between North America and Russia are $180. How Can You Use Aeroflot Bonus Miles? 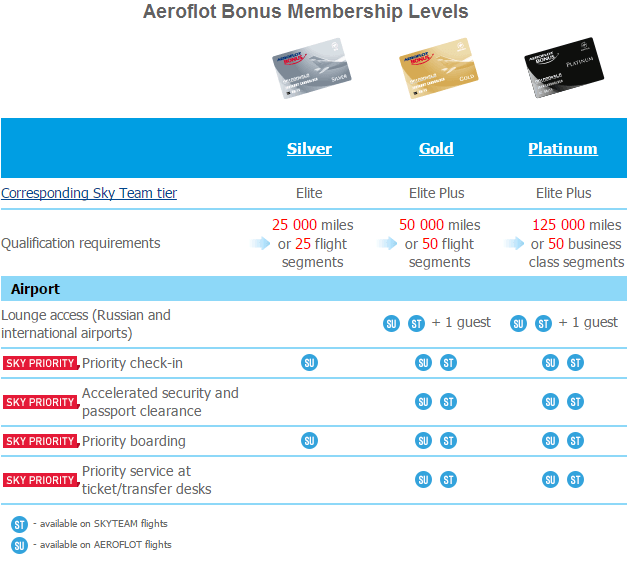 Aeroflot Bonus has different redemption levels for its own flights and SkyTeam carriers. They publish an award chart for partner airlines, but only offer a mileage calculator for their own flights. Booking on partners, such as Delta Airlines, must be done over the phone and might not always be easy. The program is not known for being flexible. It doesn’t offer miles-plus-cash awards or free stopovers, and it requires at least one paid flight in the last 24 months as a condition for booking an award. If you’re flying from the U.S. to a destination outside of Russia and connecting through Moscow, that flight will be counted as two segments. You’ll end up paying more, so be careful with your routing. One of the best uses of Aeroflot Bonus miles has nothing to do with Russia. A round-trip business class flight from North America to Peru or Colombia costs 60,000 miles, and to Brazil, Argentina or Chile costs 75,000 miles. As a reference point, a Delta business class award from the Continental U.S. to southern South America costs 125,000 miles. Since Europe is divided into four somewhat arbitrary zones, there are some good deals on select flights between Russia and Europe. For example, a round-trip business class ticket for the nine-hour flight between Moscow and Iceland costs 45,000 miles. The hour and a half flight between Moscow and Kiev costs the same. At 110,000 miles, a business class ticket between the U.S. and Moscow is one of the better Aeroflot redemptions. It beats both Delta and United, and is only slightly more than American. There are many Aeroflot Bonus awards that should be avoided. All long-haul economy flights are pretty bad, including U.S. to Russia or Europe starting at 70,000 miles. That’s at least 10,000 miles more than an award ticket booked with any major U.S. carrier. Also, since most major U.S.-based airlines place the whole Russian Federation in Europe, you will be better off using American AAdvantage miles for flights to any Russian city. Even flying as far as Vladivostok only costs 40,000 to 60,000 AAdvantage miles roundtrip in economy vs. 120,000 Aeroflot Bonus miles. Due to the way Aeroflot divides Europe into zones, you should avoid some routes. For example, flying roundtrip between Paris and London costs 40,000 Aeroflot miles in economy and 90,000 in business. The same flight only costs 8,000 British Airways Avios in economy and 15,500 in business. Aeroflot allows miles upgrades on cash tickets on its own flights and SkyTeam partners. You can only upgrade from economy to business, even if the airline operates international first class. 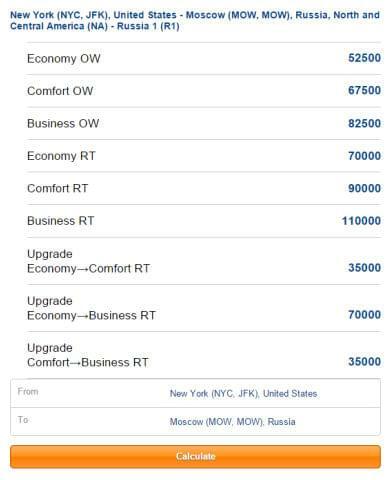 A business class upgrade between the U.S. and Moscow costs 80,000 miles per roundtrip on a SkyTeam carrier. The same upgrade on Aeroflot costs 70,000 miles, but Aeroflot also allows you to upgrade to Economy Comfort for 35,000 miles. An award ticket cannot be upgraded. Although Aeroflot has a few credit and debit card partners in Russia, including Citibank, there are currently no U.S.-based cards.